All week I found myself in the right place at the right time. 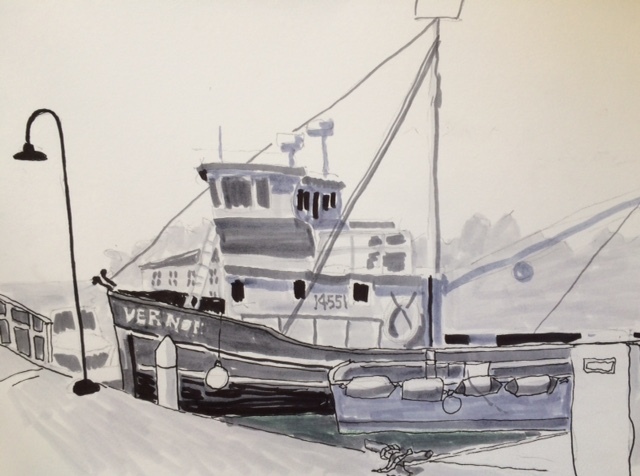 Sunday morning a convivial group of Urban Sketchers met at Fishermen’s Terminal. It’s a great place to wander for privileged views of nautical vessels. The boats are like people each with a name and a tale to tell. The light green Ballard Bridge can be seen in the distance to the north. Queen Anne Hill and Magnolia Hill rise up to the south. At Bakery Nouveau on the corner of 15th Ave E and E John Ct I enjoyed a cup of coffee and a scone while observing the activity in Williams Place Park. The green and yellow bus pavilion was a magnet for one bus after another during the 5 o’clock rush. The door to the bakery opened and shut to the rhythm and sound of the traffic along 15th Ave.
During a hike through Discovery Park in Magnolia, I retreated from the hot sun on the rugged beach to cool off in the dense shade along one of the park’s roads. 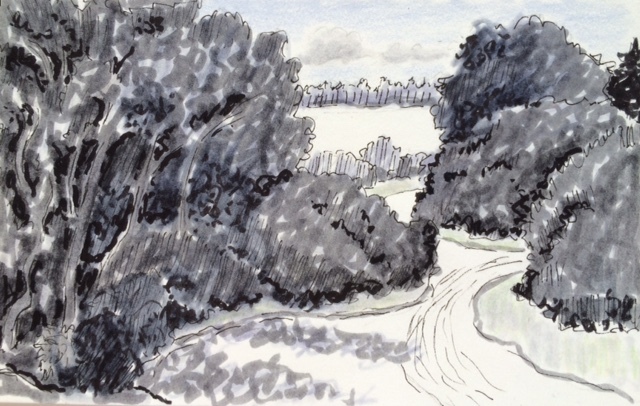 The difference in temperature revived my energy levels enough to sketch the vista through the thickly forested hiking grounds to the water, landfall, and clouds beyond, and for the return hike to the car. To pre-empt crosstown traffic, I arrived so early for a meeting I had time to visit Seward Park. 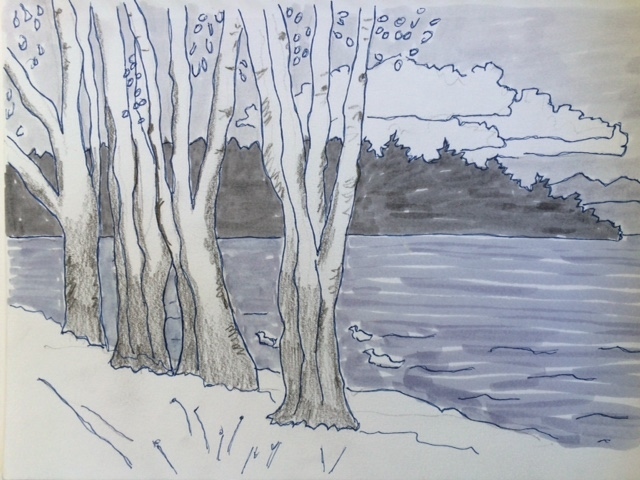 Within the park, a commanding row of two-toned trees edge Lake Washington. Mercer Island floats in the distance as ducks frolic close to shore in the chilly water. 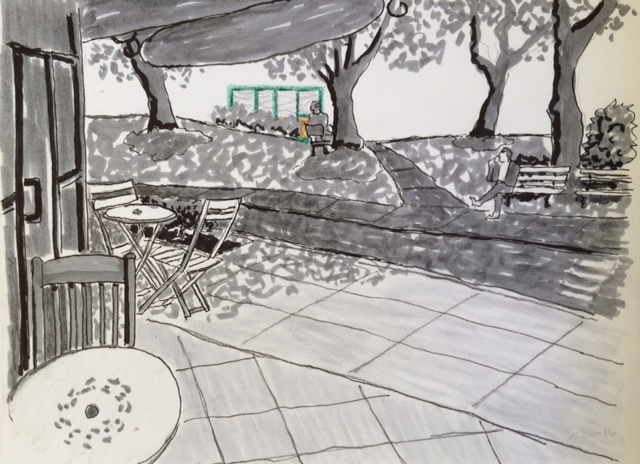 Sounds like a perfect week -- full of sketching, friends, beauty and serenity.